What are some of the major end time signs that point to the soon return of Jesus? Nathan Jones: Israel is THE sign of the end times pointing to the Lord's soon return. August, could you cover some of the other signs we are witnessing even in the news today that also point to the Lord's soon return? August Rosado: I would have to look at the European Union. The European Union I believe is the infrastructure or foundation for a future revived Roman Empire. The European Union will produce the Antichrist — the Beast — mentioned in Revelation 13. When you look at the European Union today, there are 27 member states with a citizenship of over 500 million people. They are looking to have their own police force. I can look at the headquarters of the European Union today and see it is designed to look like the incomplete tower of Babel. We are going back to Genesis 11 with this imagery. They are today using a symbol of rebellion against God to represent something that is going to be global in the future according to the Bible. Dr. Reagan: They claim they are going to be able to do what they failed to do at the Tower of Babel. They are going to unite all of humanity in rebellion against God. August Rosado: That is exactly right. They want to unite everyone and that is what they are saying on their website. Nathan Jones: How do you know that the Antichrist is coming out of the European Union? August Rosado: When you look in Daniel 9:26, it talks about the prince of the people that shall come and shall destroy the city of the sanctuary. We know that was General Titus the son of Vespasian who came into Jerusalem in 70 AD and wiped out Herod's Temple and scattered the Jews to the four corners of the earth. Daniel 9:27 says, "And he shall confirm a covenant with many for one week." Since Daniel tells us 69 weeks have already been fulfilled for over 483 prophetical years or 173,880 days, then we know that the Antichrist must come from those people who destroyed the city and the sanctuary. I reject this goobly-goop view that's arisen today of a Muslim Antichrist. I am not convinced of that in any way, shape, or form. He must be of European descent, particularly Roman descent. He must come out of the people who destroyed the city and the sanctuary. That is the Antichrist of Revelation 13:1. Dr. Reagan: It is really amazing to think about what is happening in Europe because people have tried to reconstruct the Old Roman Empire many times throughout history. The idea of European unification has never died. They always tried to do it with military force. Napoleon tried to do it, and many others like Charlemagne. But, it had to be God's timing, and when it became God's timing it just all came together peacefully without military force after WWII. Suddenly, we have it today. August Rosado: Exactly, Paul-Henri Spaak who was the former Belgian Prime Minister and President of the Consultative Assembly of the Council of Europe nearly 50 years ago said this, "We are not looking for another committee. We have too many already. What we need is a man of sufficient stature, one who can hold the allegiance of the people and bring us up out of this economic mess that we are sinking into. Send us such a man, and be he God or the Devil, we will accept him." I think the latter half of his statement will be the case, and he is on his way as foretold in Revelation 13:1. Dr. Reagan: What would be another sign that you would see today that points to the soon return of Jesus? August Rosado: I would have to say apostasy in the church. There is so much heresy in the church today that it's not even funny. I am reminded of what Paul said in 1 Timothy 4:1, "Now the Spirit speaketh expressly, that in the latter times (the last days) some (thank God not all, but some) shall depart from the faith, giving heed to seducing spirits, and doctrines of demons, and doctrines of devils." That's exactly what we see going on today. Dr. Reagan: We've got major Christian leaders all over the place today. These so called "Christian" leaders are very influential, but they are denying all the fundamentals of the faith like the Resurrection, the Virgin Birth, and the Second Coming of Jesus. August Rosado: That is exactly right. As a matter of fact, Paul again picks up on that in 2 Timothy 3:1-5, and I love what he says, "This know also that in the last days perilous times shall come." If we are not living in the last days, then I don't know what. He says, "Perilous times shall come, for men shall be lovers of their own selves; covetous, boasters, proud, blasphemers, disobedient to parents, unthankful, unholy, without natural affection, trucebreakers, incontinent, fierce, despisers of those that are good, traitors, heady, high-minded, lovers of pleasures more than lovers of God. Having a form of godliness, but denying the power thereof: from such turn away." That is exactly what we see with many of these so called "Christian" leaders today — denying the power thereof. Dr. Reagan: In fact, Peter says in his epistles that one of the signs of the end times will be people scoffing at the very idea of the return of Jesus. Here we are. August Rosado: That's 2 Peter 3:3-4. He says, "This know also, in the last times there will come mockers walking after their own lusts and saying, 'Where is the promise of His Coming?'" Dr. Reagan: I once thought that referred to atheists, but now as I look around today I see Christian leaders scoffing at the idea of the return of Jesus. They claim He isn't going to be here for another 1,000 or 2,000 years and that the Church is going to conquer the earth. We are going to rule the earth and then we'll turn it over to Jesus. Such an unbiblical belief, well it's just unbelievable! August Rosado: Pan-millennialism — it's all going to pan out in the end, according to these guys. They just don't understand what the Bible says, because Paul says, "They have a form of godliness but they deny the power there of such, turn away from such." I could mention names right now, though I won't, but we know many people who come to mind that are denying the fundamental truths of the Christian faith. 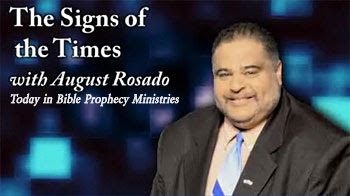 In the next part of our interview with August Rosado, we'll ask him to point out some more major signs of the end times that point to the Lord's soon return. He says he could name names but wont. Why not name names? brings to mind Luke 18:8b Nevertheless when the Son of man cometh, shall he find faith on the earth? While I do think the antichrist is going to spring from Europe, I am not convinced it will be from the current EU. I think in the future there will be 10 and only 10 nations that decide to break off from the current EU and form an new alliance. This could be due to some economic and/or military and/or other unknown future world circumstance. However, this is just a CONCEPT on my part. I could be 100% wrong. Especially when I consider the imagery the EU has chosen such as the harlot on the beast, their 12 star flag, their anthem and the Tower of Babel theme. On the other hand, isn't this one of those "the Bible says what it means and means what it says" examples when it points to TEN toes? The World leaders already acknowledge that the World is broken up into TEN regions. The EU (revived Roman Empire) will be the power house ruling these 10 regions with Rome (figuratively known as Babylon) as its Capital, where the antichrist will reign. By the way, do not think about how countries are divided now. When the Book of Revelation was written, the Roman Empire did not contain the same borders for the countries that now exist. You know when Laden was shot.. Obama.. made a statement "he was shot in the head... I also know a lot of people that don't believe he is dead" Is there anyway he could be associated with the antichrist? I trust there is room for another prophecy interpretation from a humble man of God holding no titles but a Masters Degree. The Anti-Christ and his coming power and dominion are more closely aligned with Islam/Muslim than any other political, economic and religion group/people. In terms of geography - The “old” Roman Empire, with center governance located in Rome, extended far beyond the European continent into North Africa and to the outer edges of the Middle East. The “old” Roman Empire influence was greater within the land of Islam than any other religion, or people group. In 2001, Islam (as a large segment of the old Empire) reaches beyond the Middle East into EU, Asia, the US and the world. It is positioned to influence the work of Anti-Christ (system). Islam - in belief, governance and politics - is Anti-Christian and Anti-Hebrew. The EU (common market) is one of the ten toes. The EU is not the feet. Get off the feet and consider the horns identified in Revelations for the details on political structure and power. The EU (Euro currency) will fall apart and be re-structured by an emerging economic system. The same is true for the US (Dollar). Currency is power. The US holds the power today and that is about to change. We are going global – not EU. We are into the 2nd seal (Egypt, Syria, and Turkey, Libya, Sudan and others). 3rd seal (world economic chaos with change in currency policy) will be upon us by spring 2012. Here is the surprise - 1st seal, that was September 2010 (Jerusalem Press, 9/3/2010). Why would the Anti-Christ want the Christian world to know that we just signed a 7 year peace agreement?! Keep it out of the press and call it something like “an agreement to a process”, “we have an agreement”, “we’ll leave the details to others”. All parties were present to sign the binding arbitration agreement to peace: US, EU, Palestinian Authority, Israel, and the King of Jordan too. That date makes 2017 the end of the 7 years. This leads me to share the very clear and simple “sign” the Lord gave us in Matthew 24:29. September 2015 is the beginning of “The Great Day of the Lord”. 2015is a Sabbatical Year and September is a Sabbatical month. Feast of the Trumpets and Feast of the Tabernacle occur with a "blood moon" and a solar eclipse (sun turns black) occures in the same month with those two feasts. This has never taken place before and will not happen again in a very very long time. That great and terrible day is at the end of the Great Tribuation. Yes, we are within the 7 weeks. Obama is not the Anti-Christ. He is Muslim by birth if not faith. But the Anti-Christ is a Muslim. There is no other established religion on the earth that is as opposite to Jesus Christ and the people of God (Israel). It is simple. You have written some very interesting things. I might almost be persuaded except that Jesus clearly taught that we cannot predict when the Second Coming will take place. If the 7 year treaty had commenced it would be possible to know the exact day Christ will return. We are not given that possibility. It is clear that Jesus does not want us to get caught up in time speculations. "As to the day and hour, no-one knows ......". Most on this site believe in a pre Tribulation rapture. I believe the it is possible to make predictions AFTER the rapture but not before. The scriptures tell us about set number of days - all around the 3.5 year mark, ie 2 sets of 3.5 years. Let's be real. There are loads of treaties in existence and new ones are always being made. The one you mention could be one of many similar treaties. Does not necessarily mean it is the ONE. I would say that the nature of THE treaty will be different from the one you mentioned. Regarding Islam being the global force which introduces the antichrist, it is mere speculation based on letting the current news influence your reading of scripture. We should always separate CURRENT events when studying the scriptures and not make it fit in. Ezekiel 38-39 suggest Islam could be greatly weakened before the appearance of the antichrist. Note the list of nations very much coincide with Islamic strongholds. You are referring to Revelation 13. In that chapter it says "I saw a beast coming out of the sea. He had ten horns and seven heads ....", "One of the heads of the beast seemed to have had a fatal wound, but the fatal wound had been healed"
The Beast contained ALL 7 heads. It was just one head of his heads that received a fatal wound, not all 7. I don't believe it is talking about the antichrist being wounded when we consider the context. Revelation 17:10 explains that the 7 kings are 7 empires that have arisen in history. Note the Bible always discusses prophecy foremost in light of its affect on Israel. Five have fallen, one is (at that time Rome was still an empire) and one is to come. Assyria, Babylon, Persia, Greece all fell (not sure who the 5th one is)but Rome is included in the seven. Later the Roman Empire fell, but(in a sense) continued on through the Babylonic Roman Catholic church. The head that received a fatal wound and yet lived could be referring to Roman empire which is now being revived (through the EU) The fatal wound has been healed! I would say that the Beast is referring to Babylonic religion. Nimrod the Father of that religion was known as a "bull". When Israel worshipped the golden calf, it was a symbol of alliance to Baal. Nimrod being the god of Baal worship. Nimrod (I believe) was a type of the antichrist. So the Beast is probably Babylonic religion, which has had control (throughout history) in Babylon, Persia, Greece and Rome then through the RC. The 10 horns represent the whole world in which the Beast has great power over. The little horn or final head, would be the reign of the ac. This is the only interpretation (making sense to me)which doesn't make nonsense of other passages within the Book of Revelation and seems to be consistent throughout. From what I have heard RTM is correct that the World is now made up of 10 regions. Psalms 40 said "Why would the Anti-Christ want the Christian world to know that we just signed a 7 year peace agreement?!" Only a celebrated and highly publicized treaty would create an atmosphere for the pseudo 3.5 years of "peace" allowing for the rebuilding of the Jewish Temple. According to you we are almost 1 year into this secret agreement. That now leaves only 2.5 years for the new temple to be built. What makes you think, given the current world situation, that the Arabs would ALLOW the building of the temple. When the next temple is built, the Arabs will ALLOW it. Israel will be duped by this false "peace period". We are by no means in a period of peace, real or fake. And also we ARE in a "Christian world" right now but the world of the antichrist will NOT be a Christian world by the standards of today. There will be new Christians after the Rapture but they will be hated. No, the antichrist will not reign in a "Christian world". I think you nailed the issue, Billy. The above theory sounds like the failed ENP treaty that people were so adamant about. I frankly believe that the Prophet Daniel was describing the fact that the AntiChrist will come not from the land of the people (Rome), yet from their offspring. The United States is this offspring, the landscape of our nations capital bear witness to their love or Rome and Babylon. Our national emblem of the Eagle was the standard carried by the Legions of Rome. Our currency has occultic imagery all over it, surely it is not the God of the Bible in which they trust. The AntiChrist will come from the seat of commercial Babylon with the Harlot Church in her midst. The United States is indeed in Bible Prophecy, yet it has a new name, Babylon. The Statue of Liberty is modeled after the Roman goddess of freedom Libertas. The diadem she wears represents the seven seas and seven continents. Rome does not possess the infastructure to supply the world with luxuries, nor is it a military power, nor does it possess a large amount of Jewish exiles in whom God calls them out of, that they might not partake of their sins. She rests in the midst of a multitude of seas while those transporting her goods will weep at the site of her burning. The United States fits this category undeniably. The reformation brought the demonization of Rome, indeed they are evil, yet Rome will not be this central power, it is a new empire as all the old have passed. Rome is a crumbling infrastructure, it could not maintain as distribution center of the globe. The architects of the U.S. await the AntiChrist, they have prepared the Beast System, their Masonic Temples pay homage to Satan. First the nation will be brought down, then it will be rebuilt, a new name, a new symbol. The Phoenix will be the emblem of it's rebirth from America to Babylon.